In 1986, I was fortunate to work in Dharmsala with Tenzin Chodrak, the Dali Lama’s physician. He was amazing to behold – like a human MRI machine – able to diagnose precise anatomical problems as well as biochemical disorders. In theTibetan culture, one can not become a medical doctor until you already become… a priest. Associated Press/Ashwini Bhatia Dalai Lama speaking last month to Tibetan students at the Tibetan Children’s Village School in Dharmsala, India, about the principles of Buddhism. “Dream ”” nothing!” is one of the many things I’ve heard the 14th Dalai Lama say to large audiences that seem to startle the unprepared. Just before I began an onstage conversation with him at New York Town’s Hall in May, he told me, “If I had magical powers, I’d never need an operation!” and broke into guffaws as he thought of the three-hour gallbladder operation he’d been through last October, weeks after being in hospital for another ailment. For a Buddhist, after all, our power lies nowhere but ourselves. We can’t change the world except insofar as we change the way we look at the world ”” and, in fact, any one of us can make that change, in any direction, at any moment. The point of life, in the view of the Dalai Lama, is happiness, and that lies within our grasp, our untapped potential, with every breath. Easy for him to say, you might scoff. He’s a monk, he meditates for four hours as soon as he wakes up and he’s believed by his flock to be an incarnation of a god. Yet when you think back on his circumstances, you recall that he was made ruler of a large and fractious nation when he was only 4 years old. He was facing a civil war of sorts in Lhasa when he was just 11, and when he was 15, he was made full political leader and had to start protecting his country against Mao Zedong and Zhou Enlai, leaders of the world’s largest (and sometimes least tractable) nation. The first words the Dalai Lama reportedly said when he came into exile, I learned not long ago, were “Now we are free.” He had just lost his homeland, his seeming destiny, contact with the people he had been chosen to rule; he had been forced to undergo a harrowing flight for 14 days across the highest mountains in the world. But his first instinct ”” the result of training and teaching, no doubt, as much as of temperament ”” was to look at what he could do better. Now. 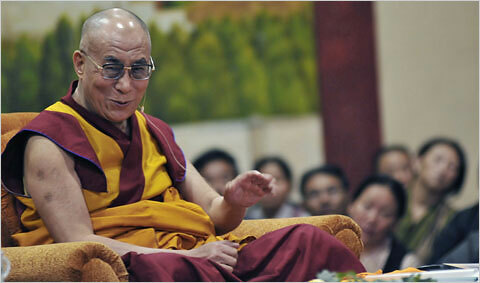 He could bring democratic and modern reforms to the Tibetan people that he might not so easily have done in old Tibet. He and his compatriots could learn from Western science and other religions, and give something back to them. He could create a new, improved Tibet ”” global and contemporary ”” outside Tibet. The very condition that most of us would see as loss, severance and confinement, he saw as possibility. Not all Tibetans can be quite so sanguine and far-sighted, of course, and in terms of a resolution of Tibet’s political predicament with China, the Dalai Lama has made no visible progress in 50 years. Beijing is only coming down harder and harder on Tibet, as he frankly admits. But when I watch him around the world, I see that he’s visiting other countries and traditions in part to offer concrete, practical tips for happiness, or inner health, the way any physician might when making a house call. Think in terms of enemies, he suggests, and the only loser is yourself. Concentrate on external wealth, he said at Town Hall, and at some point you realize it has limits ”” and you’re still feeling discontented. Take his word as law, he constantly implies, and you’re doing him ”” as well as yourself ”” a disservice, as you do when assuming that any physician is infallible, or can protect his patients from death in the end. None of these are Buddhist laws as such ”” though in his case they arise from Buddhist teaching ”” any more than the law of universal gravitation is Christian, just because it happened to be formulated by Isaac Newton (who said, “God created everything by number, weight and measure”). I’ve been spending time for 18 years in a Benedictine monastery, and the monks I know there have likewise found out how to be delighted by the smallest birthday cake. Happiness is not pleasure, they know, and unhappiness, as the Buddhists say, is not the same as suffering. Suffering ”” in the sense of old age, sickness and death ”” is the law of life; unhappiness is just the position we choose ”” or can not choose ”” to bring to it. ”My profession,” said the Dalai Lama instantly, as if he hardly had to think about it. His answer could mean many things, but one of the better things it meant to me was that that kind of happiness is within the reach of almost anyone. We can work on it as we work on our backhands, our soufflÃ©s or our muscles in the gym. True happiness, in that sense, doesn’t mean trying to acquire things, so much as letting go of things (our illusions and attachments). It’s only the clouds of short-sightedness or ignorance, the teachers from the Dalai Lama’s tradition suggest, that prevent us from seeing that our essential nature, whether we’re Buddhist or not, is blue sky.